A life lived with dogs has amazing highs and devastating lows. This year has been an emotional rollercoaster with the joy of seeing our amazing youngsters hit the trail for the first time and the inevitable sadness of saying goodbye to old friends. Sadly, old age and health problems finally caught up with first Mojo and then Beany and both joined the eternal sled dog team this year. Mojo was almost 15 and Beany 14. They both had enjoyed full, well lived and happy years and no one can wish for more than that (other than for our dogs to have lives much less fleeting than they are naturally blessed with, of course). Beany was the foundation of everything we have. She only had one litter, of four puppies, in her amazing life. This past weekend, three of those “pups” who will be 10 years old in May ran at the BSHRA Santon Downham race, so did 11 of her grandkids and 7 of her great grandkids. They notched up, I think, a total of eight top three places over the weekend with the winning six dog team on both days entirely made up of Beany progeny. Pretty awesome. I like to think all of these amazing kids, grandkids and great grandkids must sometimes notice a silver grey dog with a big smile running alongside them on the trail. The great grandkids, of course, are Rogue’s puppies who, not one to hang around, she produced speedily and without fuss over three hours one amazing night in October 2016. She had nine. Six stayed to race with us at Mystic Charoite with three going to friends (two of these to live with their sire Bear and John and Mary Carter (John is the current WSA World Dryland 8 Dog Champion). The youngsters, who like all our dogs are fed on a diet of Alpha High Performance with the addition of meat or fish, have been in training all summer and took part in their first race at the end of October. We have spent the first half of the season moving our teams around, letting the pups run in different positions on teams of different sizes, as this year is all about bringing on the yearlings and letting them learn from the wealth of experience and talent on our teams including mum Rogue, grandpa Brew who is still running very well aged 9 and a half and plenty of aunties and uncles. These are exciting times and the youngsters have been going from strength to strength. The odd turn mishap aside, created by over enthusiastic youth overruling experience, the teams have put in some great runs with plenty of top three places, having raced already with BSHRA, SHCGB and SDAS this season. 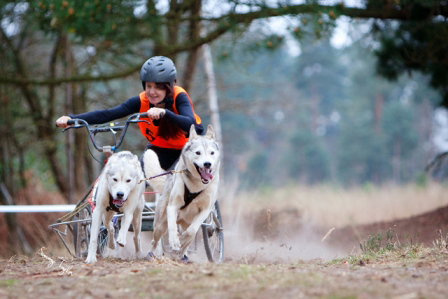 We have lots to look forward to in the coming months with the rest of the BHSRA Championship Series, supported by Alpha, and the SHCGB Aviemore race when we will head up to the Cairngorms for a week of racing, hopefully running dogs in snow (we can but hope!) and giving our fantastic oldies some lovely Highland walks.